I was talking to an engaged friend a few weeks ago as we talked about her wedding plans and excitement to be married. Somewhere within that conversation we started talking about the perfect and endless analogies that God put in marriage to reflect His desired relationship with us. They truly are endless! And it's because God Himself designed marriage to be, not just one big analogy, but a million little analogies that are just waiting to be discovered and wondered at. Why shouldn't this amaze us? All that to say, I am continually humbled and amazed by both my own sinfulness and the Lord's great grace and love towards me. It's a perfect balance that simply leads me to greater dependence on Him, the desperate kind of dependence that is like jumping into His arms and throwing everything I have into His love and protection. Last week was another moment when marriage taught me one of those oh-so-humbling lessons. Jon and I have only been married 11 months, so to say we are still figuring out the balance of a financial-life-for-two is an understatement. It requires a lot of discussion (probably more discussion than we give it) and one of those discussions left me feeling a flurry of emotions. I wasn't exactly angry or hurt, and Jon technically hadn't done anything wrong... So before I let my emotions explode over something that wasn't really a problem or a wrongdoing, I took a step back to do my own heart investigation with the Lord. And of course, in the sweet way that only Jesus can, I came to realize the embarrassing reasons that I was upset, and they were all ugly and selfish and materialistic. I wasn't upset with Jon, but I almost wished he had done something wrong so that I could blame it on him, get upset, and that would be it. But no, my emotions had risen because my own selfish purposes had been revealed. I certainly could have acted like it was still Jon's fault. I'm good at coming up with reason why I should be upset, and justifying why I should succumb to my emotions. But this time I knew I needed to confess to him what was on my heart, even though it was a tad bit embarrassing. Confession is something that we read about in the Word, and sort of nod our heads at like, "Yes, confession, that's a good thing, yep." And I think confessing things to God is a comforting practice that many Christians perform, something like "Hey God, I messed up again; I failed, but I know You never do; please teach me to lean on Your perfection instead of striving to perform my own." And that kind of confession is a good thing. But there's something in us that hesitates to confess to others. Personally, my hesitation comes from the fear that people will think I'm judgmental or hypocritical, that they'll think I have some hidden motive beneath my confession. Or I'm afraid they'll be hurt because of what I said. Confession in marriage, though, isn't an accessory. It's a necessary act, and one that needs to be done very often. Not just the kind of confession of "I was wrong, you were right; will you forgive me?" but the kind of confession that is brutally honest about what has been going on in your heart and mind. 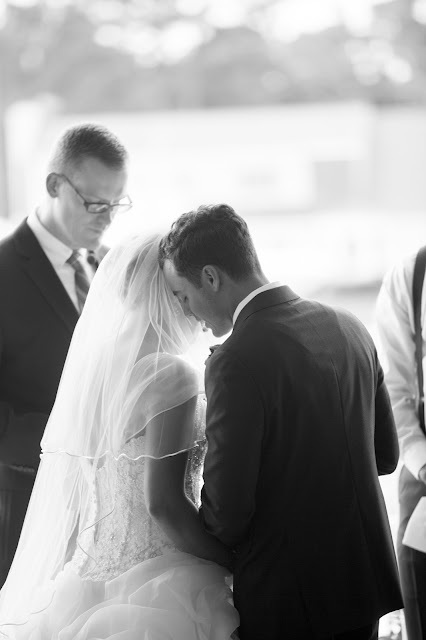 Jon praying over us as we took communion at the end of the ceremony. Confession is hardly ever fun. Jon's opinion means more to me than anyone else's on the planet, and I want him to always think and believe the best about me. Confession is literally pointing out specific areas in my life that I am still allowing sin to reign.... Why would I want him to see those areas?? 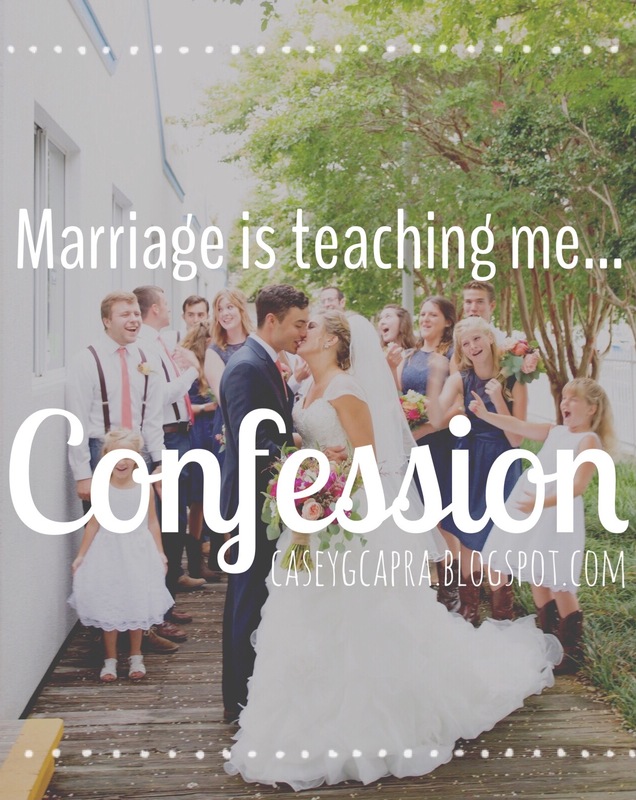 But I'm finding that confession to my husband is necessary because we are one. Spiritually, before God, Jon and I are one and inseparable. If that's the case, how could I assume that my sin does not affect him? How could I, as a part of the oneness that happens in the Jon-and-Casey-Capra spiritual relationship, expect for my sin to somehow be separate from him? This may seem simple or elementary, but I hardly ever hear people teaching on confessing your sin to your spouse, and not just your accountability partner or whatever. I more often see couples who are confessing their sins and struggles to other people who are outside of that oneness, and then never telling their spouse. Or telling their spouse that they are "handling it with their accountability partner." If confession is necessary for the wholeness of the Body of Christ, why wouldn't I start with the part of the Body that I am directly conjoined to for the rest of my life? What good is it to confess my sins to someone outside of my marriage, when my husband is the one directly affected? More than unity with my brothers and sisters in Christ I desire a deep, deep, deep unity with my husband. What follows is that he should be the first one I'm confessing to. The goal is to walk in the light because Jesus is the light. The goal is not to keep things in the darkness, because those are the things I am not letting Jesus transform! I am not good at this, but I want to get better. I don't want to let the enemy tell me that I should experience shame because of my sin and selfishness, because those aren't the words of God towards me! My God says that at confession I am free of the sin and free of the shame. Yes, sometimes it's embarrassing to admit to other humans, but by staying quiet - especially to my husband - is agree with the enemy's words, not God's. Why do you think that your husband is a head of the house? Do you feel that he's superior to you? You both work from what I understand so why aren't you equal? I love this post! It is so inspiring! I fond confession quite hard, but your post reminded me just how good it is for us as the Body of Christ. Thanks for sharing! Thanks so much for linking up at Grace + Lace! I was just talking with my small group 2 days ago about confession. We noticed that it's spoken of more often than carried out. So I appreciate your post as the first thing God led me to about confession! I am married, but I think this post is relevant for those married or unmarried. 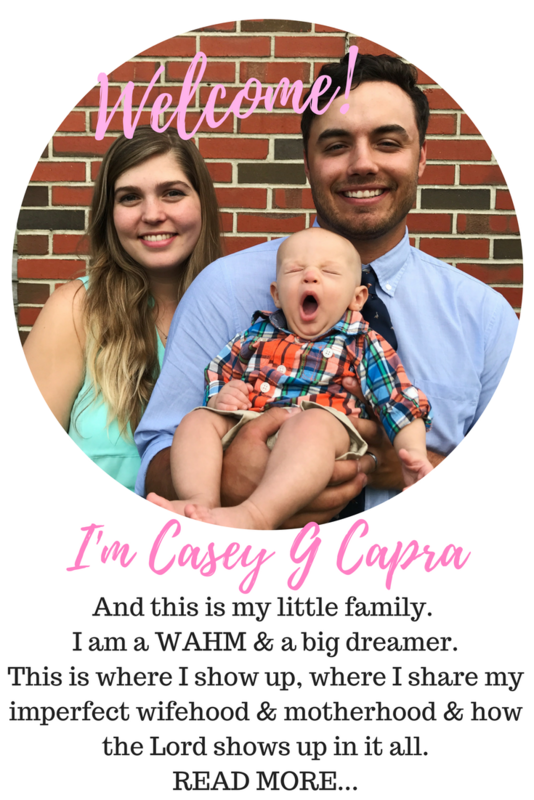 Keeping Up with the Capra's: Celebrations! Currently July + A Giveaway!